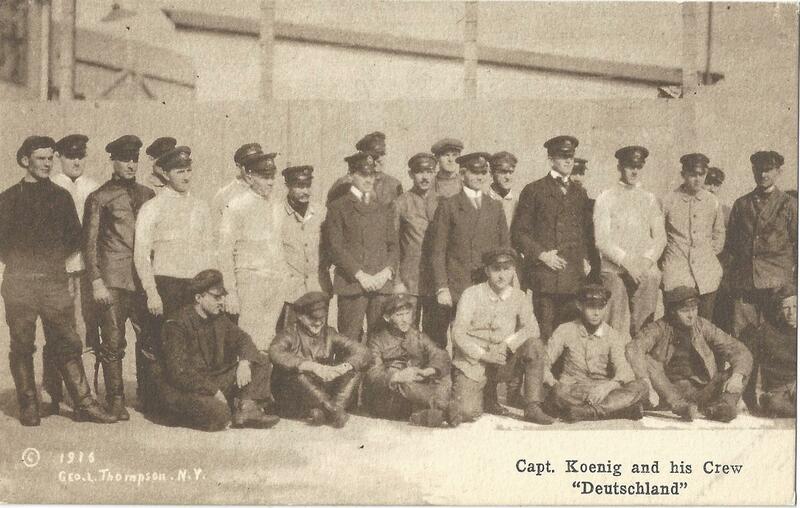 Captain Koenig and the Crew of the Deutschland. Interesting. This Real Photo postcard dating from 1916 appeared – at first glance – to be the Captain and senior officers of a German ocean liner, interned by the Americans on the outbreak of the First War. When I saw it, I assumed that it would fill a useful slot in The Sayers Collection. There are other cards of this genre, and the year 1916 would be logical for this assumption. No such luck. A check on returning home from the event where I purchased this card showed that the liner Deutschland had been renamed in 1910 after 10 years of Transatlantic service, so was not operating under that name after 1910. And it wasn’t the battleship Deutschland, which had gone into service in 1903. So who are these men? What were they doing in 1916? And why the varied range of attire, some of it casual except for their hats? Surprise! They are the crew of a significant German submarine, which went into service in 1916 as a cargo vessel for the North German Lloyd line, christened as the Deutschland. She and a sister submarine were unarmed non-naval vessels designed to evade the British warships blockading Germany. With a capacity of 700 tons, they were designed to carry strategic materials from America and deliver high-end German products like aniline dyes to the U.S. It appears that they were the first-ever purpose-built cargo-carrying submarines. There was considerable controversy because the British blockade of Germany could not stop these undersea ships from carrying strategic cargo. Britain claimed that by not interning this boat the Americans were favouring Germany. America was neutral at this stage of the war and concluded that it could not discriminate in regard to what was essentially a cargo ship. If it had been armed and a ship of the German navy, the position would have been different. Deutschland made only two trips – one to New York and a second one which involved Baltimore. There are images online from the second voyage, but none of this first voyage! Photographer and publisher is G.L. Thompson, New York. In 1917 Deutschland was taken over from the North German Lloyd shipping line by the German navy, armed for war service, and renamed U-155. Her cargo-carrying ability was inadequate and the need for more attack submarines transcended her value as a cargo carrier. Even though her design was not that of a conventional submarine, serving until the end of the War she reportedly sank over 20,000 tons of Allied shipping. 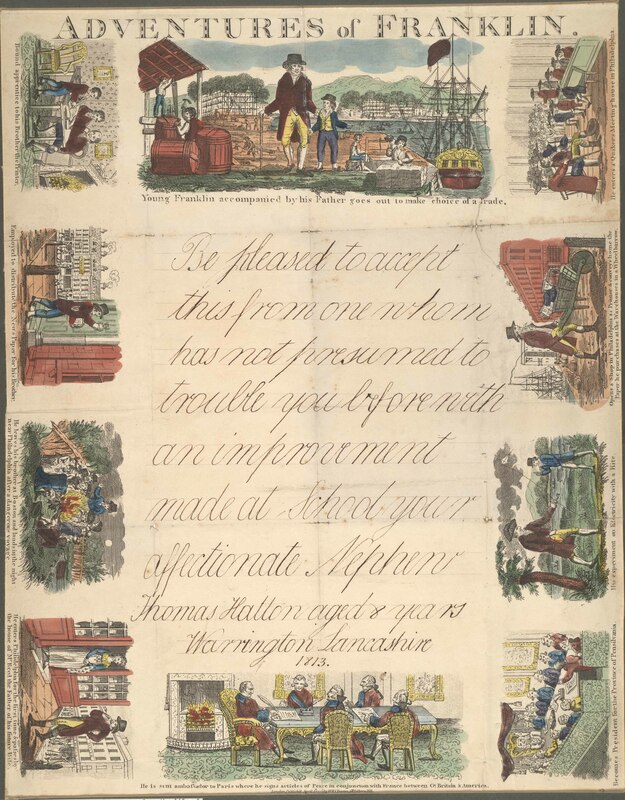 This postcard, and thousands of other pieces of ephemera, is contained in The Sayers Collection in the John Johnson Collection at the Bodleian Library. A vast quantity of other ocean liner ephemera capturing social, shipping, historical, and commercial information in The Sayers Collection, continues to migrate across the Atlantic to the John Johnson Collection. We are grateful to John Sayers for continuing to commentate his fascinating donation of Ocean Liner ephemera in this series of blog posts. 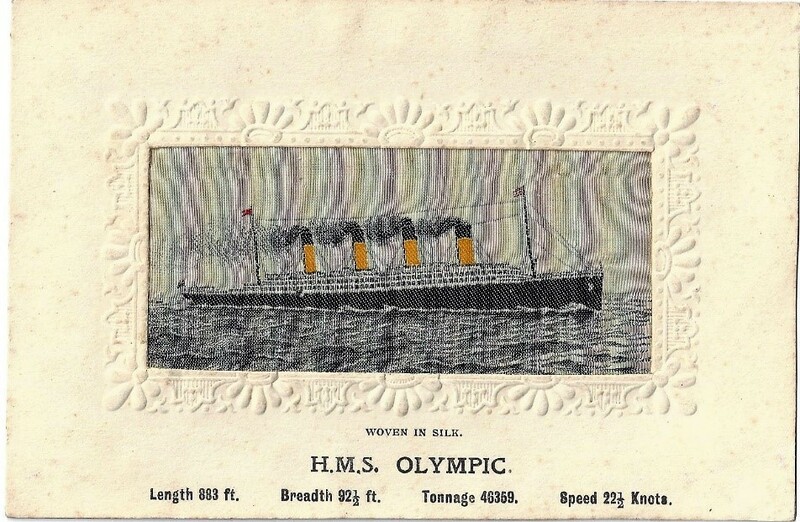 The SS Olympic, sister ship to Titanic, was launched and entered service prior to the Titanic. They were so similar that interior pictures of the Olympic could also pass for images of the Titanic. 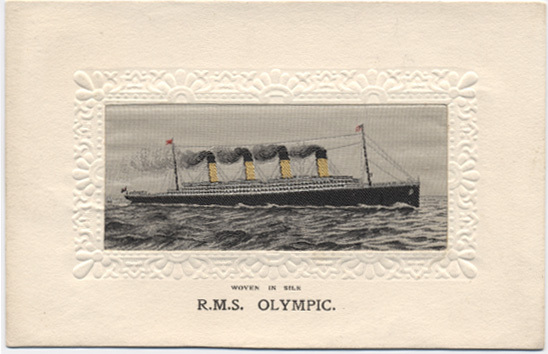 Titanic didn’t survive her first voyage, but Olympic sailed on for over 20 more years. 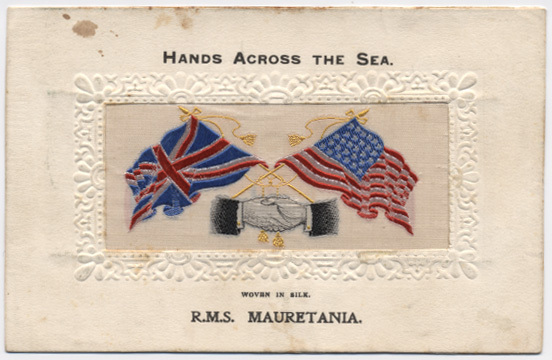 Part of those years were during wartime and a recent postcard find reminds us of that service. Adding to the Stevengraphs in the Sayers Collection at the John Johnson Collection is a charming postcard captioned as the ‘H.M.S. Olympic’. This card is not to be confused with the other example of the same ship that is in the Collection. It’s from the period when she was serving as a White Star Line passenger liner and Royal Mail Ship (hence ‘R.M.S.’). This iteration is different. Why ‘HMS’, which would denote a naval ship? Other references to her war service show her as HMT – His Majesty’s Transport. 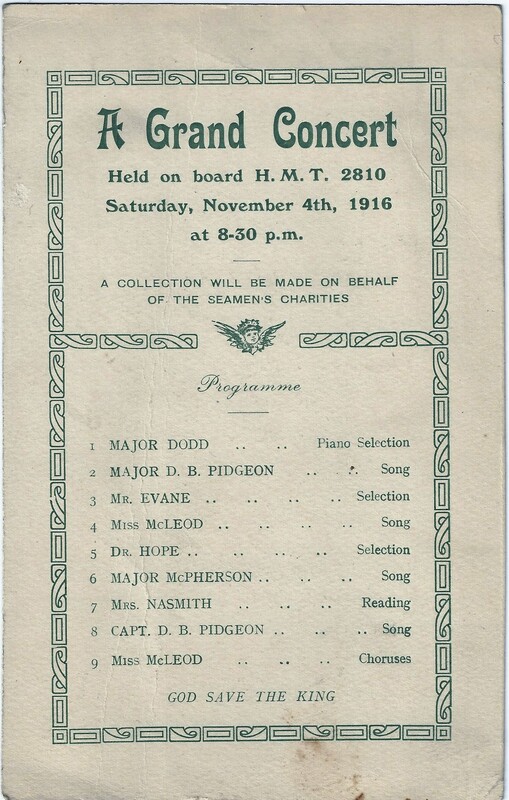 Specifically, a ‘Grand Concert’ Program of November 4, 1916 shows her as H.M.T. 2810 (left). One can only assume that the publisher of the card wasn’t familiar with naval designations. Regardless of the inaccuracy, it’s a beautiful card. This postcard, and a significant amount of other White Star Line and wartime ephemera is contained in The Sayers Collection in the John Johnson Collection at the Bodleian Library. A vast quantity of other ocean liner ephemera capturing social, shipping, historical, and commercial information in The Sayers Collection, continues to migrate across the Atlantic to the John Johnson Collection. We are very privileged to have a guest post by Dr Terry Hale from the University of Hull. An expert on annuals, this festive post explores a little-known corner of the John Johnson Collection. 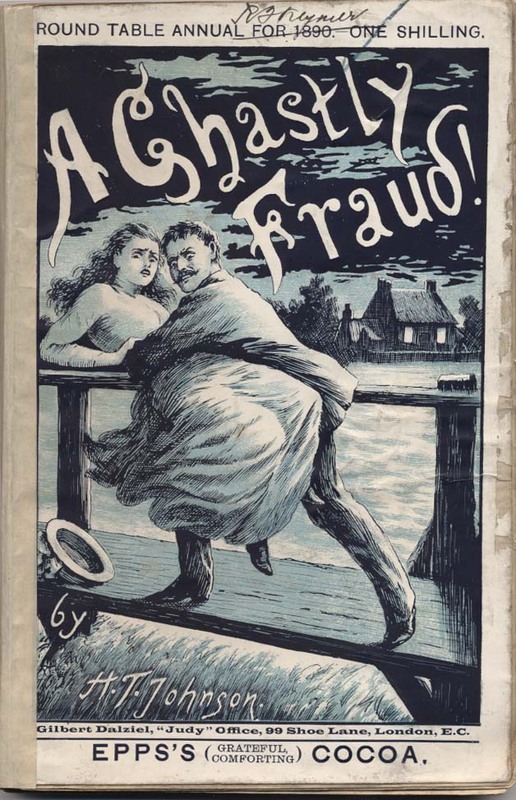 Despite the considerable level of academic interest in Victorian literary culture, much of it in recent years focusing on sensation fiction, the more ephemeral publications of the era – notably, Christmas Annuals, the closely-related Summer Numbers/Annuals, and even, starting in the early 1880s, the Shilling Shocker – have fared much less well. 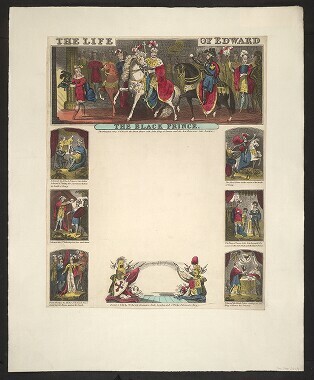 This is all the more surprising given that such ephemeral productions, though looking back to such relatively well-documented forms as the literary annuals, gift books, and keepsakes of the 1820s and 30s, were largely a product of the same forces that gave rise to Victorian sensationalism or, in the case of those productions aimed at juvenile readers, an attempt to mitigate and channel those forces in more wholesome directions. A large part of the problem is, of course, that such ephemeral productions have simply not survived. 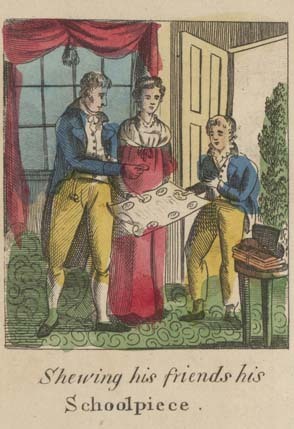 By and large, readers discarded such material almost as quickly as they acquired it, probably at the same time they took down their decorations in the case of Christmas Annuals or while packing their trunks before returning home from their holidays in the case of Summer Numbers, while collectors, bibliophiles and librarians have tended to view such material as unworthy of their attention. Even Shilling Shockers, with their fragile paper wrappers and far from sturdy paper spines, were hardly designed to survive more than a single railway journey. But if accessing Beeton’s Annual poses considerable problems for researchers, there are a great number of lesser annuals – including those attached to such standard Victorian monthly periodicals as Belgravia, London Society, or Tinsley’s Magazine – that pose no less insurmountable obstacles. 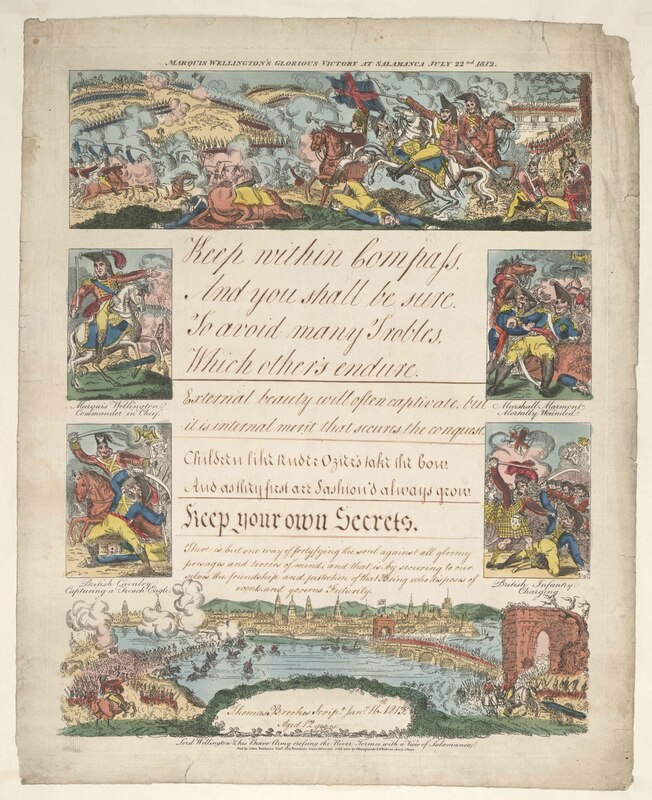 It is for this reason that the John Johnson Collection, accessible through the Bodleian’s Weston Library, is such a useful resource. 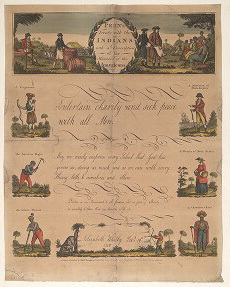 For although the Collection is, like those made by other collectors, a serendipitous enterprise, it contains not only a great deal of material not available elsewhere, some of which allows us to patch the gaps in other collections, but that material comes complete with the fragile paper wrappers in which such items were originally issued. 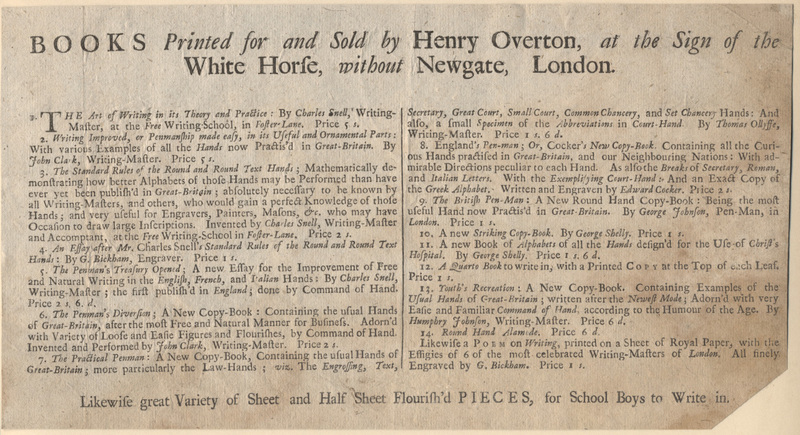 This business of wrappers is more important than one might imagine since the covers often contain information about price, publisher, year of publication, and even the name of the editor which is not repeated elsewhere. The vast majority of annuals that have survived have been bound together higgledy-piggledy without wrappers which makes even the question of assigning a date to them something of a laborious process. More significantly, however, the John Johnson Collection has particular strengths of its own: firstly, in the field of annuals aimed at children; secondly, in the not unrelated area of annuals produced by evangelical groups; and, thirdly, with regard to the emergent sensation novel. Thus, Annuals Box 10 (of the thirteen box-files in which the annuals are stored) contains a useful set of the lavish Christmas Numbers (1869, 1870. 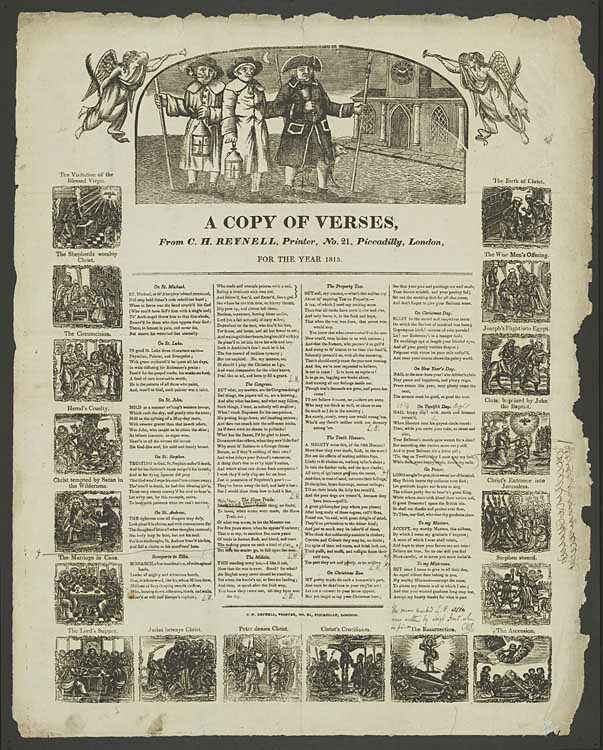 1879 to 1886) offered by The Quiver, a periodical perhaps attempting to soften its strongly evangelical stance following the death of its proprietor, John Cassell, in 1865. 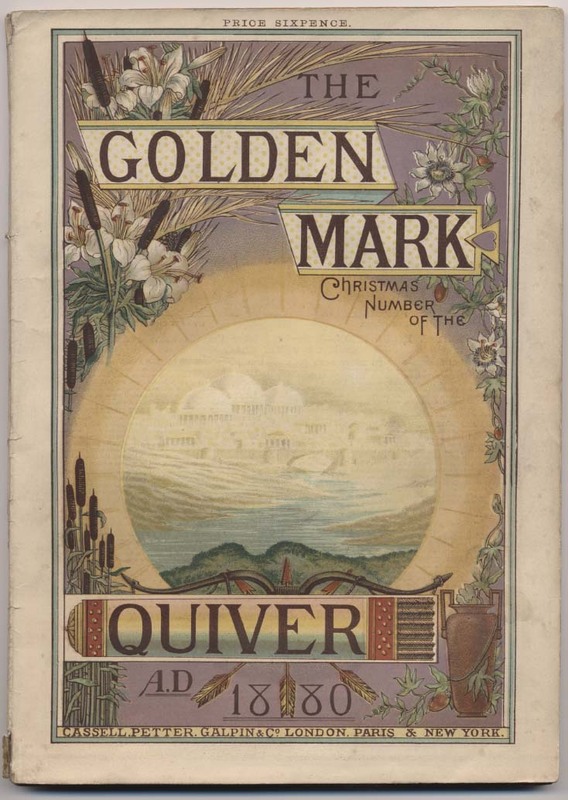 One of the high points of examining this set of material was the discovery of a little known story by the writer Bernard Heldman dealing with fraud (‘To Be Left Till Called For’, The Golden Mark, Christmas Number of The Quiver, 1880). Since Heldman himself was later convicted of fraud and subsequently changed his name to Richard Marsh when he started writing sensation fiction, this item is something of a curiosity. 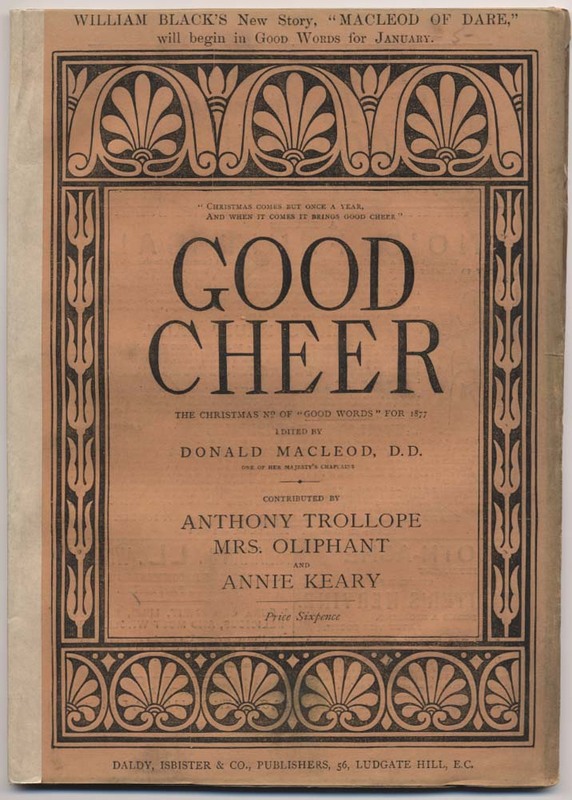 Elsewhere we find the 1877 Christmas Number of Good Words with contributions from Anthony Trollope and Margaret Oliphant (Box 5); the The Fireside Christmas Number for 1895 (again Box 5); and Paths of Peace, 1897, the Christmas Number of the Sunday Magazine (Box 11). 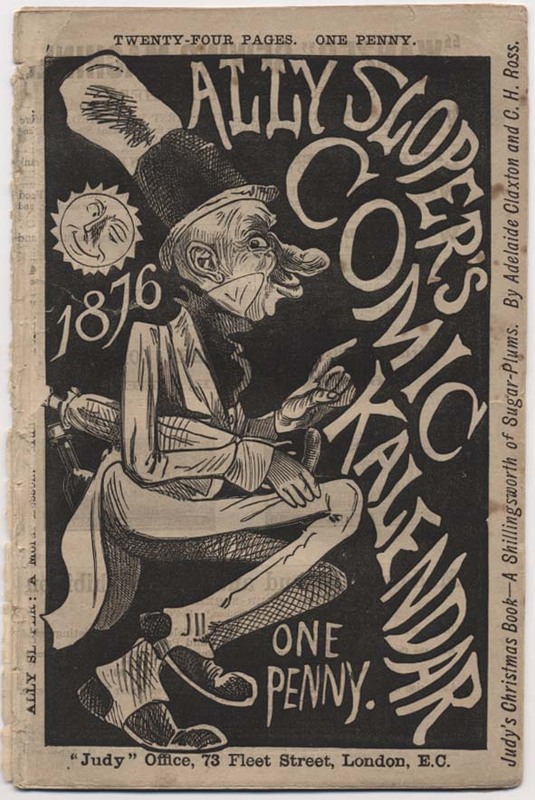 Another interesting body of material aimed at the children’s market, though this time of an entirely secular nature, is to be found in Box 1, which contains four Summer Numbers of Ally Sloper’s Annual (1881-1884), together with a twelve-year run of Ally Sloper’s Comic Kalendar (1876-1887). The hand behind all this material is Charles Henry Ross (1835-1923). In August, 1867 Ross published a full-page picture strip in the humorous magazine Judy, of which he was then editor. 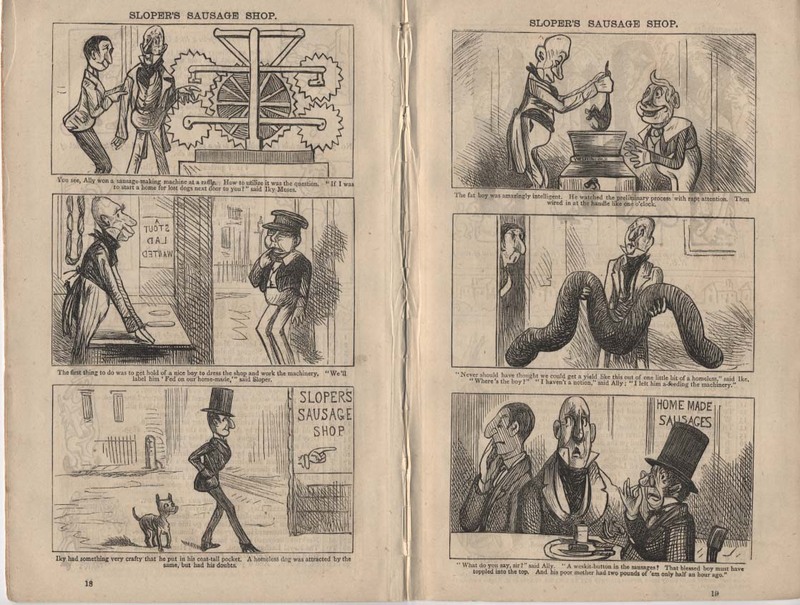 This picture strip, entitled ‘Some of the Mysteries of Loan and Discount’, introduced the character Ally Sloper – thereby creating what is now generally considered the first British comic strip. 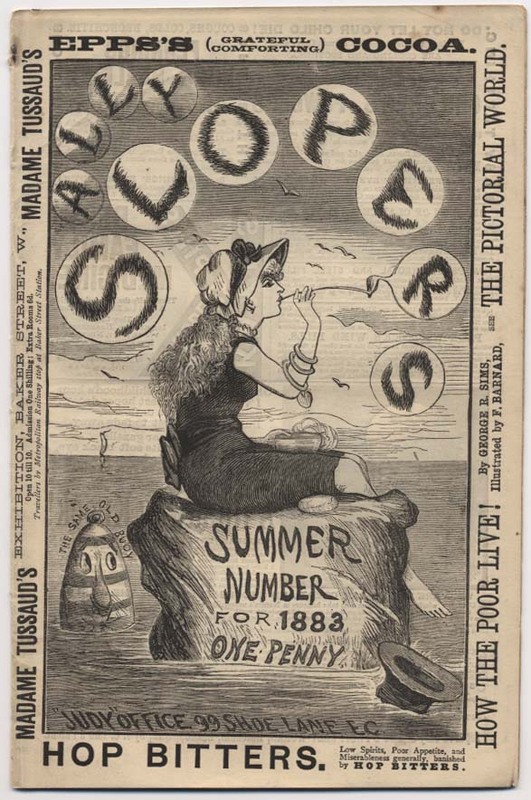 Judy was taken over by the artist Gilbert Dalziel in 1872, though Ross’s wife, Marie Duval, who had stronger graphic skills than her husband, continued to draw the Ally Sloper strips until 1879. Finally, in 1883, Ross sold his rights in Ally Sloper to Dalziel. 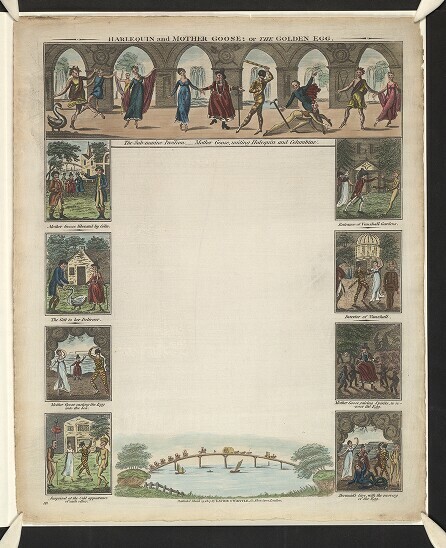 The material gathered in the John Johnson Collection, therefore, casts considerable light on this early transitional phase in the development of the comic strip. Ross’s work both as a writer and as a graphic artist extended far beyond Judy. 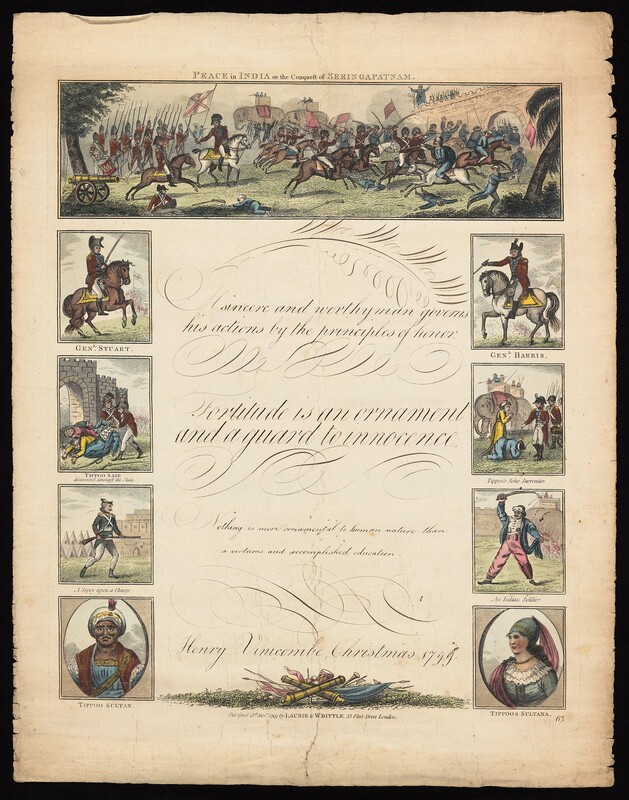 During the same period, he was also supplying both Beeton’s Christmas Annual and Routledge’s Christmas Annual with comic strips as well as various skits and stories. Ross is also a significant, though largely overlooked, figure in the development of sensation fiction. It now seems likely, for example, that he was the principal author of the pseudonymous Penny Dreadful Ruth the Betrayer; or, the Female Spy (1862-63), a work which is now considered to have been the first to introduce the figure of the female detective to popular literature. 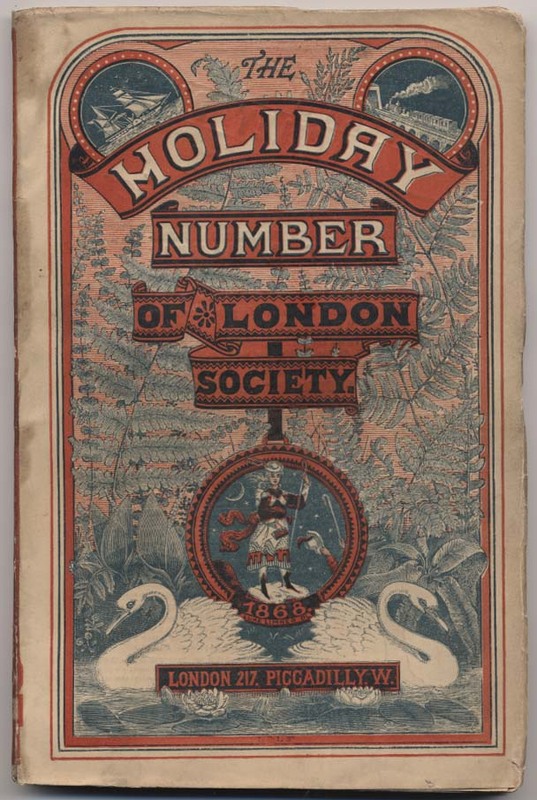 Paradoxically, though shilling monthlies such as Belgravia and London Society were at the forefront of publishing sensation fiction in instalments, their various Christmas and Summer Annuals, though by no means devoid of interest, are relatively tame affairs. London Society was launched by the publisher James Hogg in 1862. From the outset, it published a Christmas Annual and, starting around 1868, a Summer Number as well. 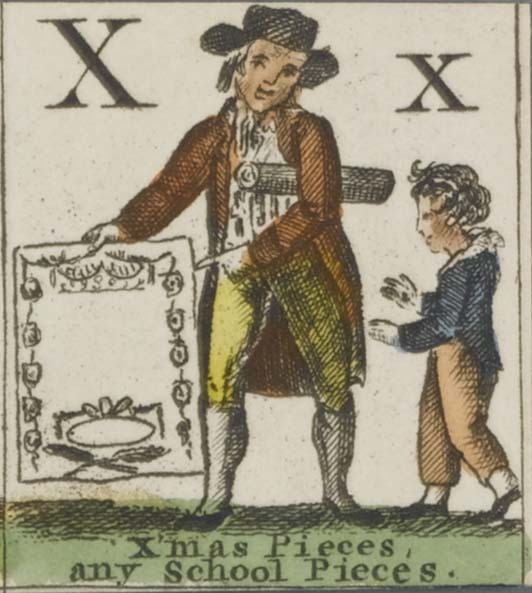 However, while tracking the evolution of the Christmas Annual has been made slightly easier by the fact that, at least as far as the early years are concerned, copies are occasionally to be found in bound collections of the periodical itself, this is not the case with regard to the Summer Numbers which are very scarce. On this basis, the five copies of the London Society Summer Numbers (for 1868, 1869, 1871, 1875, and 1886) in the John Johnson Collection (Box 7) are of particular interest, not least since they all retain their bright paper wrappers. Indeed, while the noted bibliographers Sadleir and Wolff both list their holdings of the Summer Numbers, the earliest issues they record are for 1872 (Sadleir) and 1874 (Wolff) – the John Johnson Collection, therefore, indicates a slightly earlier launch date and raises the possibility of an even earlier one. 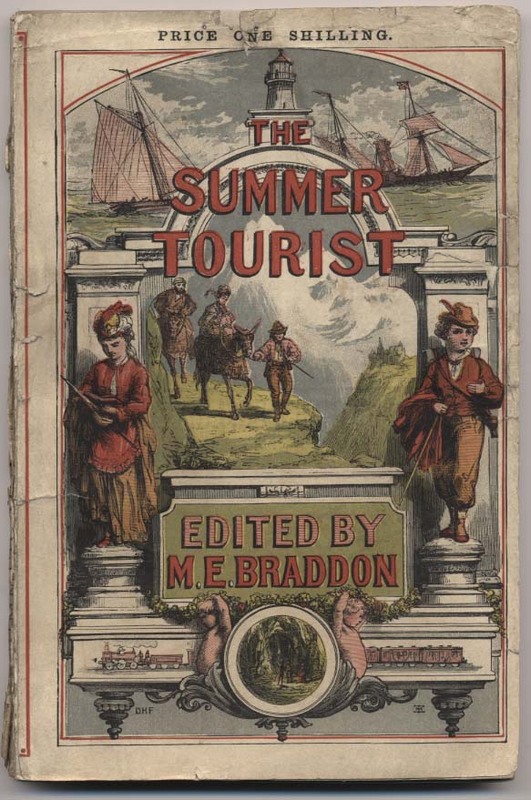 Interestingly enough, the contents of these early Summer Numbers themselves – and we can include here Mary Braddon’s The Summer Tourist of 1871 (Box 11) – provide a fascinating glimpse of how the Victorian Miss came to terms with the new phenomenon of the middle-class family holiday. 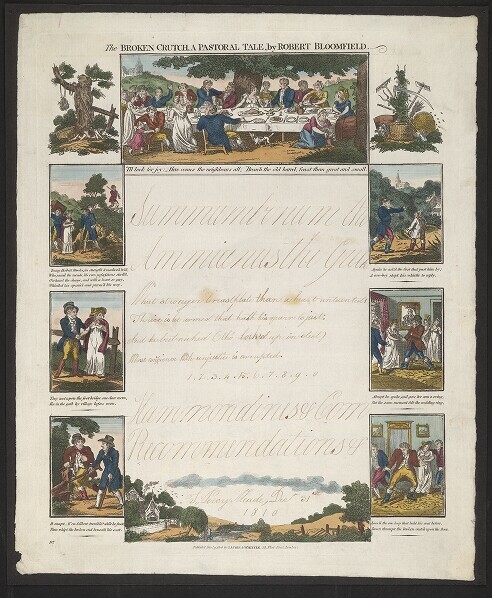 Thus, the various articles, stories, and poems, not to mention illustrations, deal with such issues as the merits of one destination over another, both at home and abroad, how to select a hotel, the advantages and disadvantages of travelling companions, picnicking, and even the etiquette and management of seaside romances. Needless to say, other researchers will undoubtedly find other pathways through the John Johnson Collection and other points of interest along the way. There can be no doubt, however, that the Collection itself comprises a major repository of such material, a repository, moreover, that has not only been professionally catalogued but is easily accessible thanks to the helpful ministrations of the library staff though for those unfamiliar with the Bodleian it is certainly worth sending an email a few days in advance of a personal visit. If you work for a large corporation – particularly in a Sales capacity – you will probably be familiar with incentive programs. They are not unique to the corporate world, and an interesting historical example is the Strength Through Joy travel programs offered in Nazi Germany during the 1930s. Global tourism was in recession, and in order to maintain German tourist resources – and jobs – a series of travel incentives were offered through the Strength Through Joy movement. My understanding is that low-priced domestic tourism was available to the Party faithful as a reward for their support and contributions. The level of tourism was related to the amount of that support, and ship cruises were at the apex of possible rewards. A ship named the Wilhelm Gustloff was built and launched in 1938 specifically to cater to this travel trade. Noteworthy is that this was the first liner built specifically and solely for cruising. At over 25,000GRT, she was larger than many of the liners used by Cunard for Tourist Class trans-Atlantic service, and represented a significant landmark in ocean liner cruises. When Gustloff went into service in April 1938, she represented the highest travel reward for a Party member or supporter. 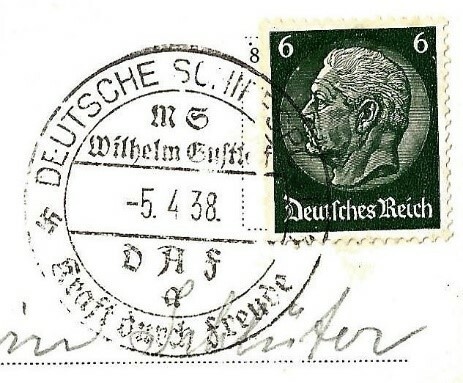 This postcard, written on the first day of her Maiden Voyage and postmarked with a Wilhelm Gustloff cancellation two days later, would make a significant statement to the recipient about the sender’s elevated stature in the eyes of the Nazi administration. The message may be mundane but the postmark tells it all. 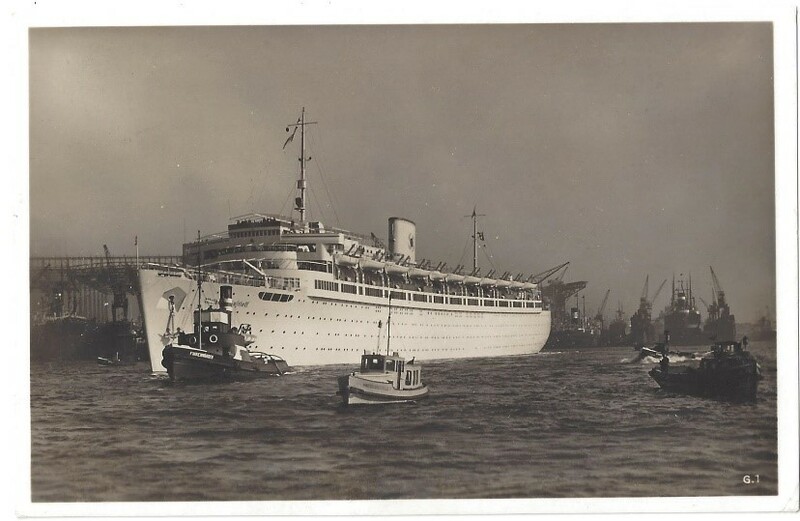 Wilhelm Gustloff was in cruising service for only a short period of time. In September 1939 she was requisitioned by the military and used primarily as an accommodation ship during the war. In January 1945, carrying a flood of refugees and wounded fleeing the oncoming Russian army, she was torpedoed and sunk by a Russian submarine in the icy waters of the Baltic. Estimates of the passengers crammed on board range from 6,000 to 9,000 – in the chaos there were no formal records kept. Most of those passengers perished, leading to the greatest loss of life in maritime history. 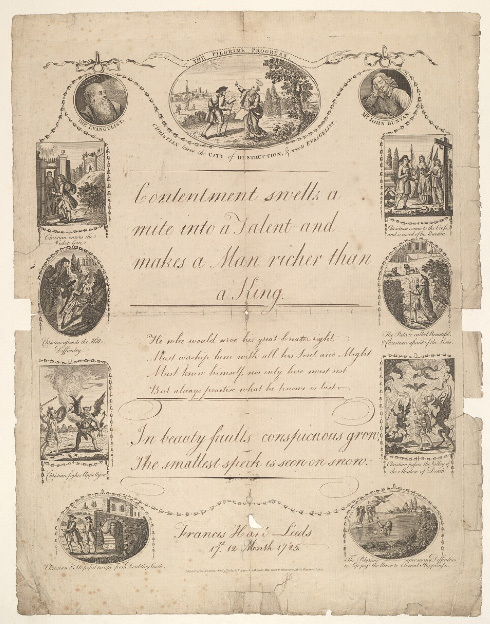 This postcard, and a significant number of other Strength Through Joy ephemera such as Menus and Cruise Activities, is contained in The Sayers Collection in the John Johnson Collection at the Bodleian Library. A vast quantity of other ocean liner ephemera capturing social, shipping, historical, and commercial information in The Sayers Collection, continues to migrate across the Atlantic to the John Johnson Collection.